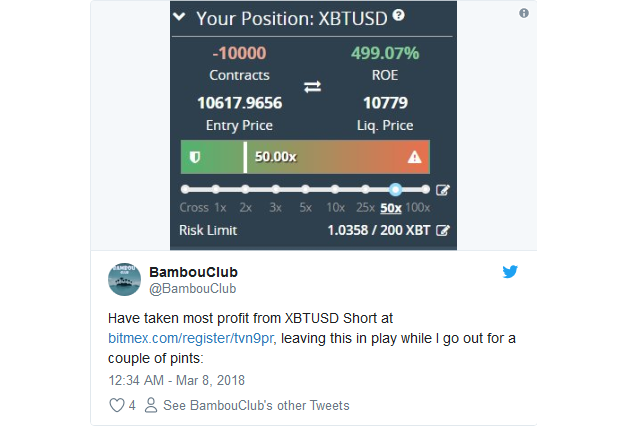 BitMEX provides a means to turn bear markets into a profitable trading opportunity. Anyone who fails to learn how to use BitMEX is limiting their opportunities in crypto trading: They are denying themselves the ability to trade Short and profit from declining prices. 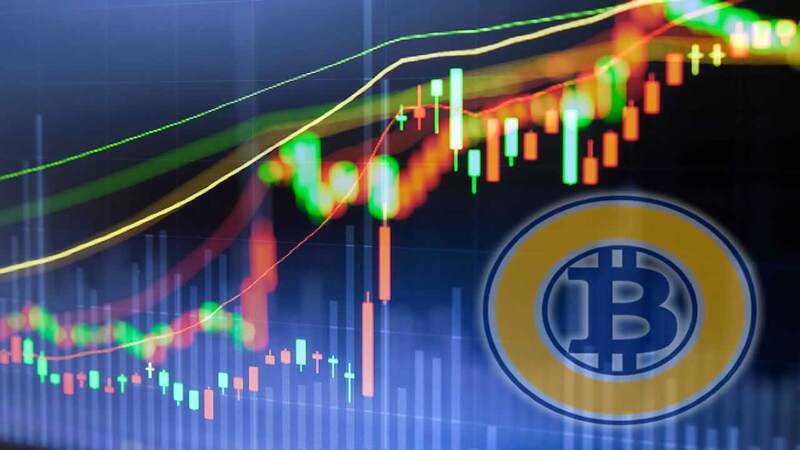 The global crypto market reached its peak on 8 January 2018 of $828 billion, and then fell by 70% to $243 billion on 1 April 2018. Those who HODL’d lost 70%. (Nearly everyone.) Those who sold for USD or EUR in January did well — they preserved their portfolio value measured in USD. 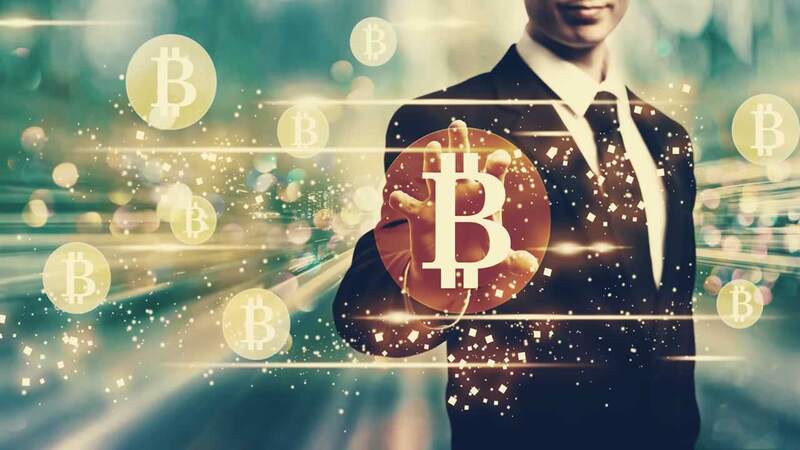 Those who sold their portfolios for USD and shorted the crypto market at or near its peak made an additional fortune to the one they made in the run-up to 8 January. Let’s start with an example of a Long as it is easier to understand. 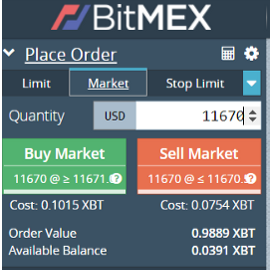 You can buy 1 Bitcoin ($11,670 at time of screenshot) with 0.1 BTC ($1,167) by buying a 10x leveraged position at BitMEX. You pay only 10% Initial Margin. You can also short the Bitcoin price (profit from a fall in its price) by Selling the Contract. The most you can lose is your Margin. This is the set-up for 10x Leveraged Long. You can increase your leverage as you gain competence. E.g. 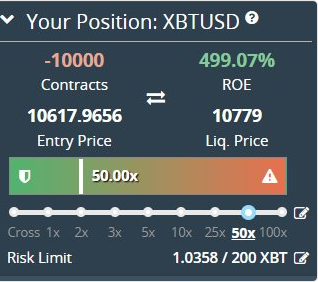 Use 100x leverage to buy 1 Bitcoin at $11,670 with 0.01 BTC, or $116. 100x leverage is gambling, likely to make a lot of money or get wiped out in minutes. But it can be profitable if used strategically during wild bull or bear runs in the XBTUSD market. Quantity: The quantity of the trade is $11,670. This is your position. But the money you place at risk is less than this, depending on what leverage you choose. Cost: The cost is 0.1015 BTC i.e. $1,184. This is the maximum you can lose. You lose the entire amount should the price fall by 10% from $11,670 to $10,500. If the price was to crash to $5,000 your loss is still limited to $1,167 which is the value of your Initial Margin. 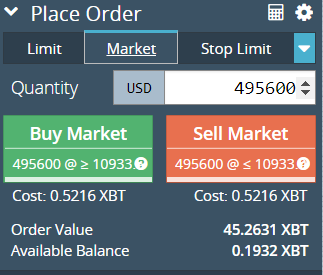 Order Value: The value of your position is 1 BTC i.e. $11,670. (0.9889 BTC to be exact.) Fees are calculated on this amount. Available Balance: This is how much you have available for trading. Cost must be lower than Available Balance to execute the trade. Note that your profit can exceed 100%, indeed it is unlimited, but your loss is limited to 100% (i.e. $1,167) , however much the Bitcoin price falls. Again, as with the Long, your profit can exceed 100% by orders of magnitude. 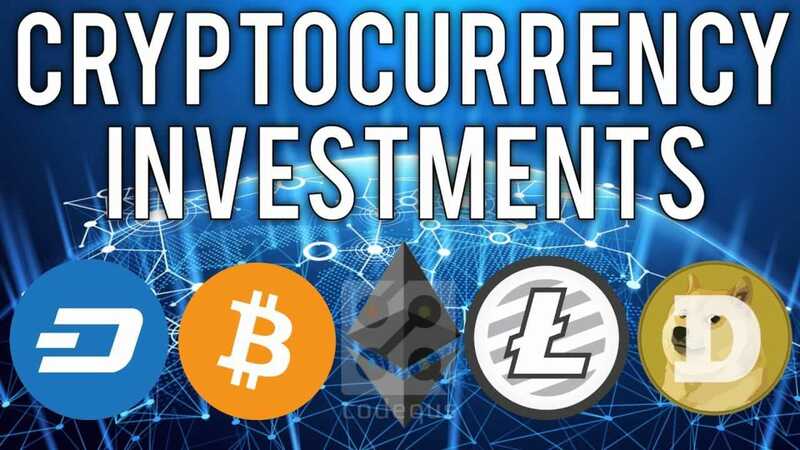 (Profit is unlimited with Longs, but there is a theortical maximum limit with Shorts which is the profit when the price has fallen by 100%, as the price cannot fall further and become negative.) Your loss is limited to 100%, however much the market rises. 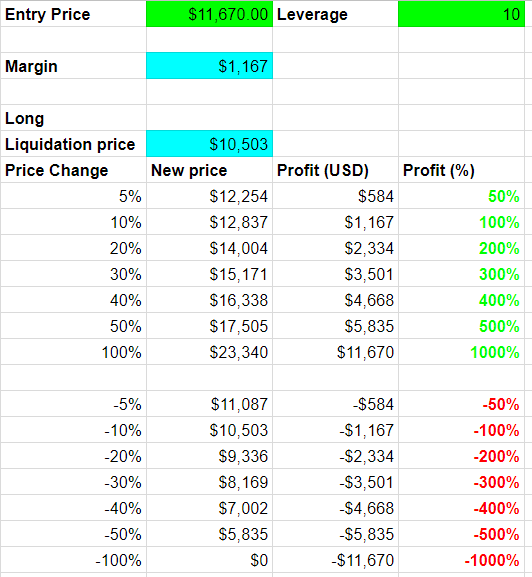 Profit/Loss Scenarios for standard Futures that are NOT Limited Risk. BitMEX Futures are safer to trade than standard Futures as Loss is limited to Initial Margin. 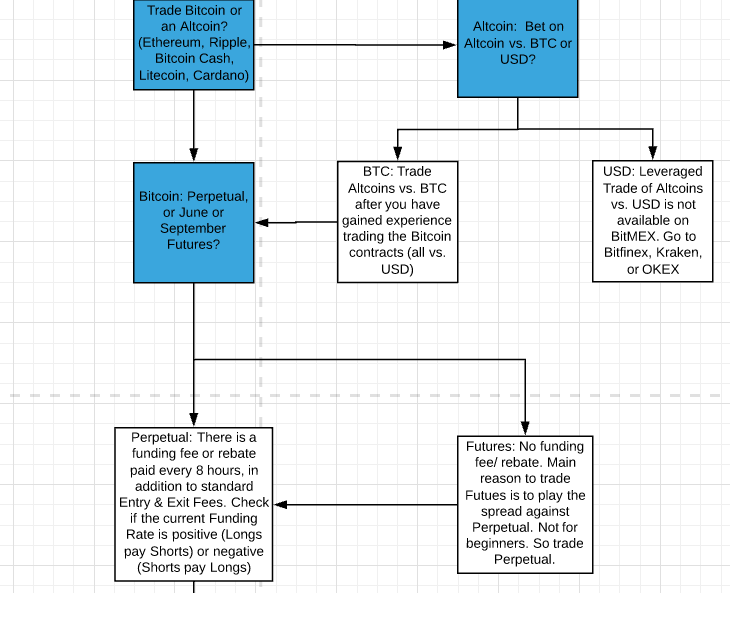 The mechanics of the BitMEX solution are that BitMEX sets a so-called Liquidation Price a fraction above the Bankruptcy Price (in the case of Longs) or a fraction below the Bankruptcy Price (Shorts). 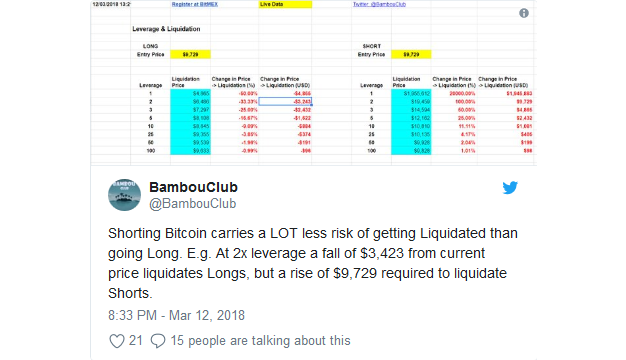 When the market moves adversely against your position and approaches the Bankruptcy Price, and breaches the Liquidation Price, the Liquidation Engine takes over your position and liquidates it automatically at market. It add any tiny profit made by the Exchange to the Insurance Fund, or deducts any loss made from the Fund. 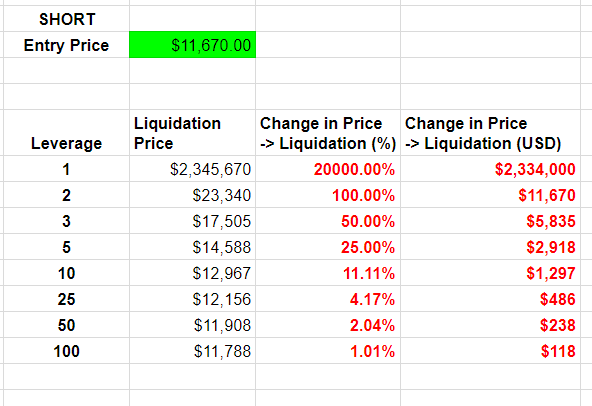 These tables shows the leverage level and the adverse change in price that will result in Liquidation. 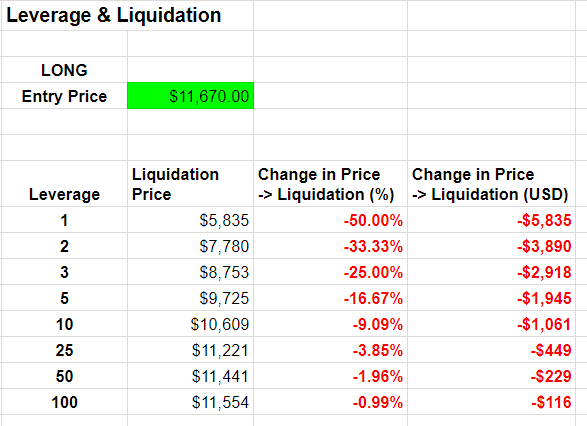 The greater the leverage the smaller the adverse change in price that will cause a Liquidation. 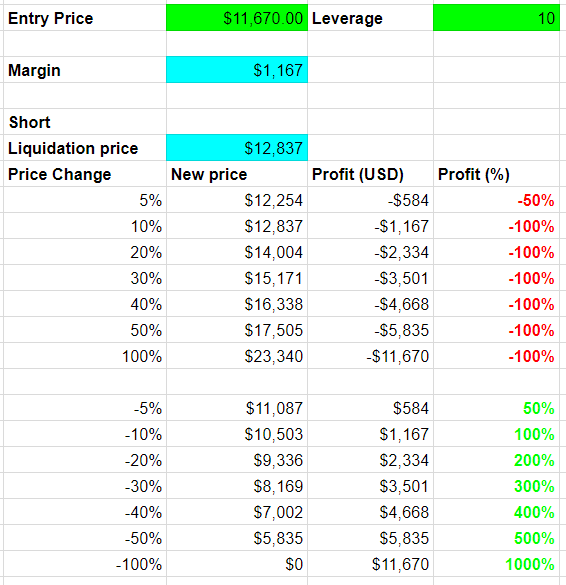 The above tables show that Shorting is safer than going Long, in that a larger percentage change (and USD change) is required to cause Liquidation when you go Short than when you go Long, for a given level of Leverage. The above tables also show that even with the minimum 1x Leverage there is a small but real risk of Liquidation when Long. But there is no risk of Liquidation when 1x Short. 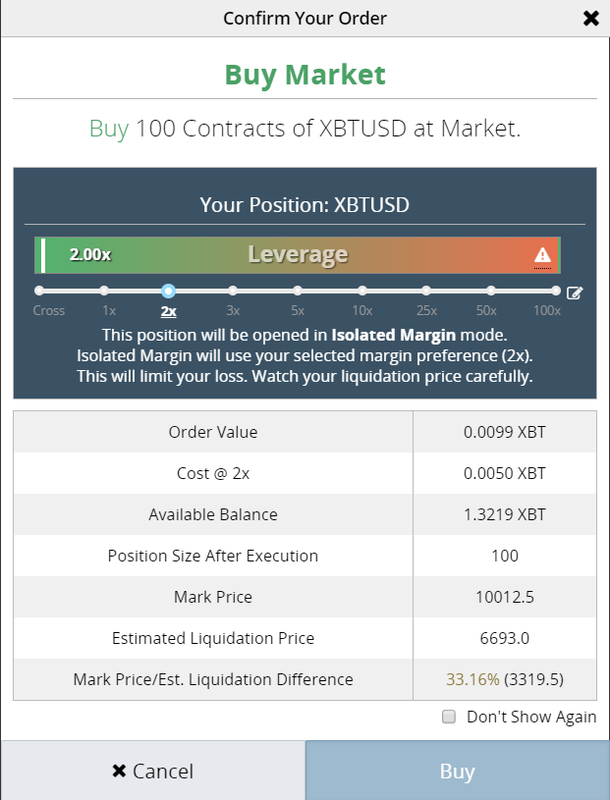 Example: you buy a $9,255 100x leveraged XBTUSD position with 1% margin, i.e. your stake is $93 of Initial Margin. 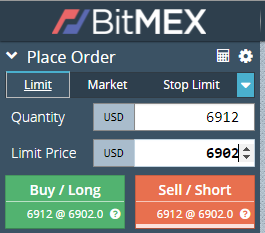 Your Bankruptcy Price (Entry Price less 1% Margin) is $9,163 but your Liquidation price set by BitMEX is $9,240. The price just has to fall $15 (0.16%) from your Entry to trigger your Liquidation and 100% Loss. That is a trade for suckers. Trading with 100% leverage on a repeated basis (Long or Short) will inevitably result in losses. The BitMEX Insurance Fund wins. Its current holding is 6,909 BTC, or $65 million. That money came from salami-slicing the testicles of 100x bulls via the Liquidation Engine. Selecting Market vs. Limit: Use Limit Trades! To use Market or Limit is one of your most important decisions. 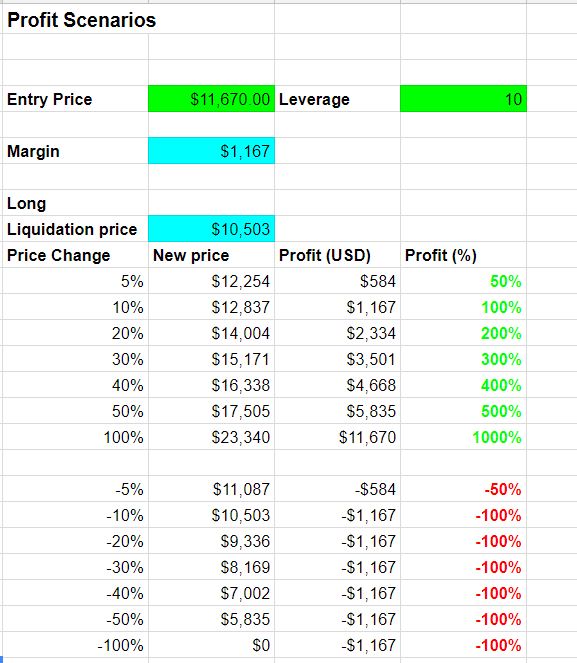 BitMEX fees for market trades are 0.075% of your total leveraged position (not just your margin) for both entry & exit. 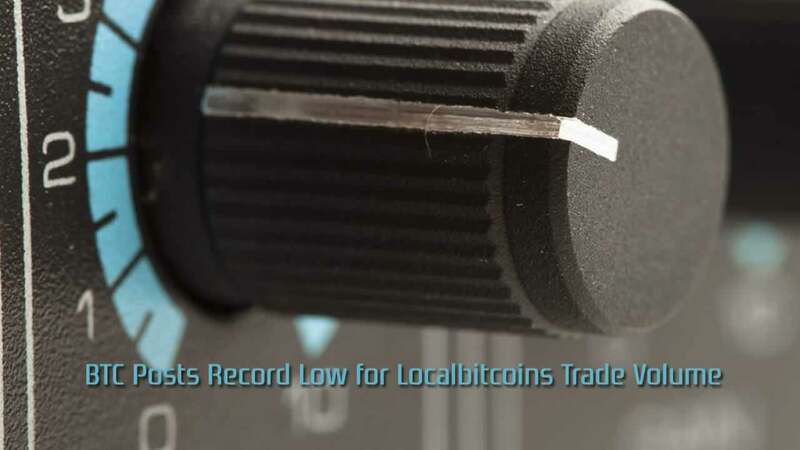 Calculate total fees on a $1,000 trade with 100x leverage. i.e you pay $1,000 Margin to open a $100,000 position. The most you can lose is the Cost: 0.005 BTC = $50. You lose that if the market price falls 33% to the Liquidation price of $6,693. When you press Buy Market, this confirmation screen pops up. Your order is not placed until you confirm Buy in this screen. 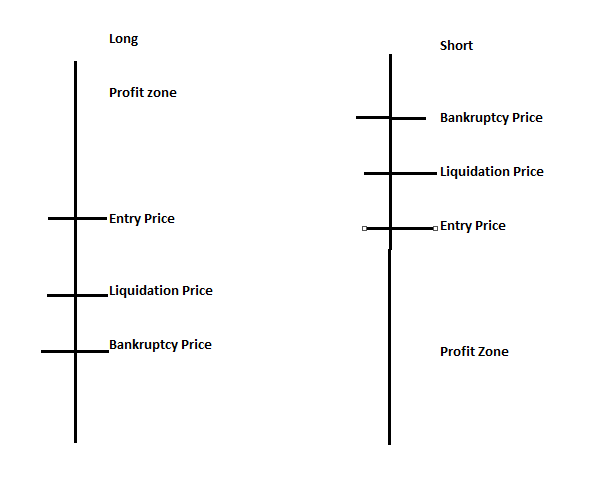 I suggest these practices in making your first few trades, to be on the safe side. Deposit a small amount into your BitMEX account so that even if you screw up you know the most you can lose. Maybe 0.05 BTC? Concentrate on one market and become familiar with it. I suggest the XBTUSD Perpetual Swap which is the most heavily traded. Staring out, ignore all other markets, the Altcoin markets and the Bitcoin Futures. Set the leverage at 2x, 3x or a maximum 5x using the Leverage Slider Bar. Don’t set too high a leverage or you might get liquidated quickly and get stressed. n.b. Do not select Cross on the Leverage Slider Bar. This exposes your whole equity balance and is risky. Setting up your first trade, the field to pay particular attention to is Cost. This shows the maximum that you can lose. The cost must be less than the Available Balance. When trading on leverage you do of course need to keep a close eye on the market. 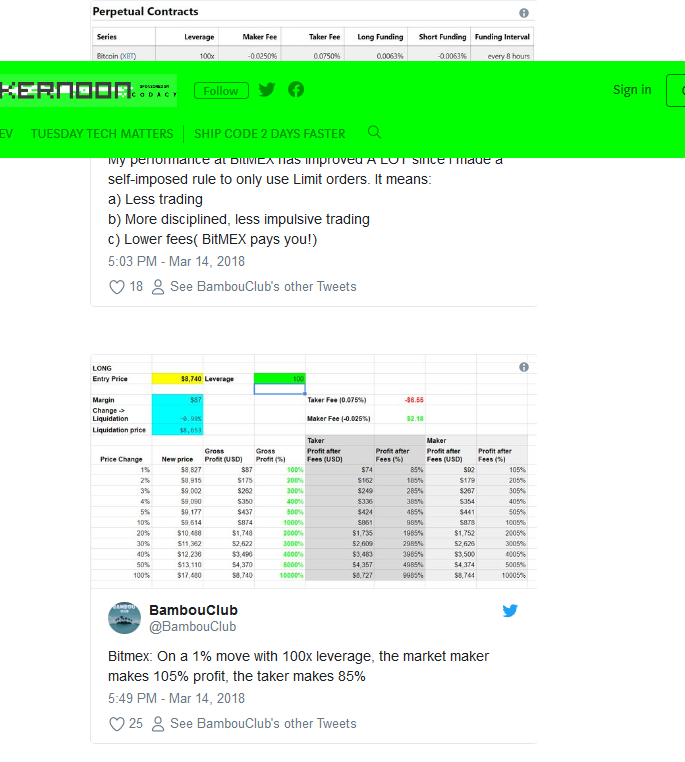 Rather than staying glued to BitMex all day, the Twitter account @BitmexRekt is useful for keeping an eye on the market. When a Long position is liquidated it means the price has fallen and breached the Liquidation Price. The BitMEX Liquidation Engine then takes over the position and closes it by Selling 495,600 contracts at the market price. 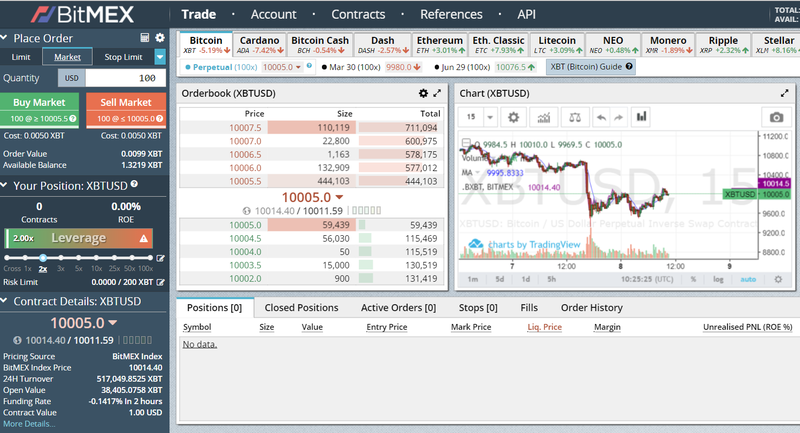 1 XBTUSD contract = 1 USD on BitMEX. (Warning: Other Futures contracts on BitMEX have different contract sizes. E.g. the contract size of the ETH Futures Contract is 1 ETH, or about $800 at time of writing.) So the trader who got liquidated for 495,600 Contracts lost a position of $495,600. He does not, however, lose $495,600. The amount of his losses depends on the leverage he was using. The greater the leverage, the smaller the loss. With the maximum 100x leverage the loss is 0.5212 Bitcoin, about $5,700 or 1.15% of the $495,600 position. Here is a video tutorial on trading Bitcoin with leverage. Altcoin.io opens on 19 May 2018. 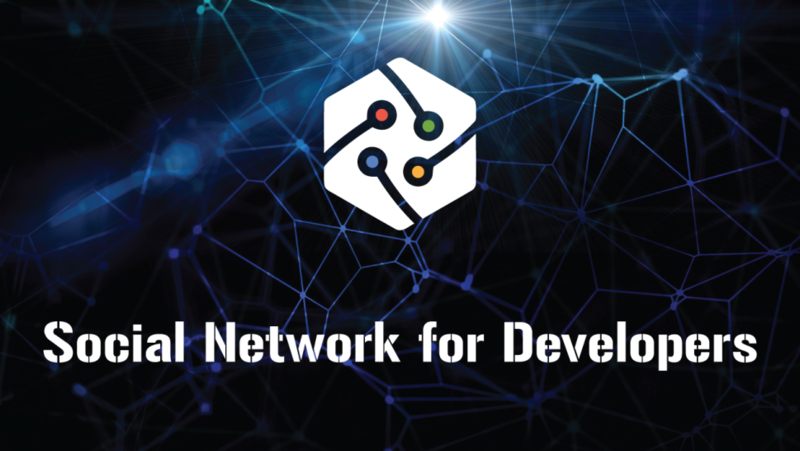 It is is a decentralized exchange (DEX) powered by Atomic Swaps. You will then be given your own Referral Link. Sign on new users and you will then receive a commission from the trading fees paid by your referred users of the exchange. 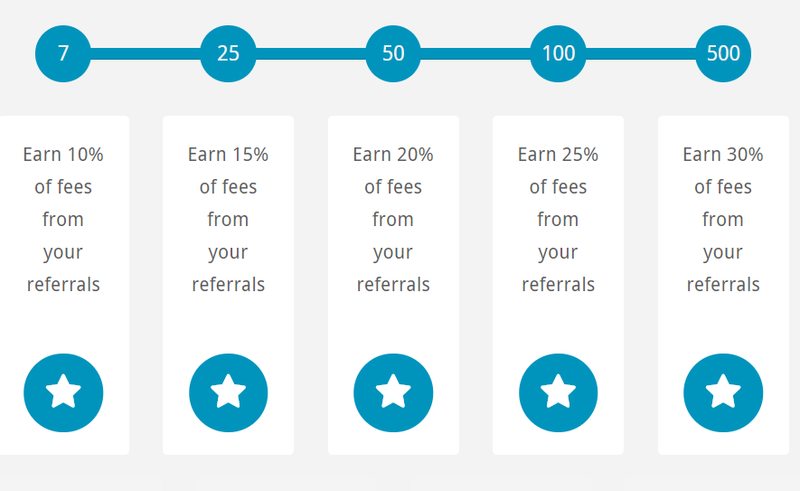 It starts at 10% (for a minimum of 7 Referrals), and rises to a possible 30%. Forever.